US Energy Secretary Ernest Moniz said that the cost reduction of renewable energy is absolutely crucial for the success of growing climate ambitions. 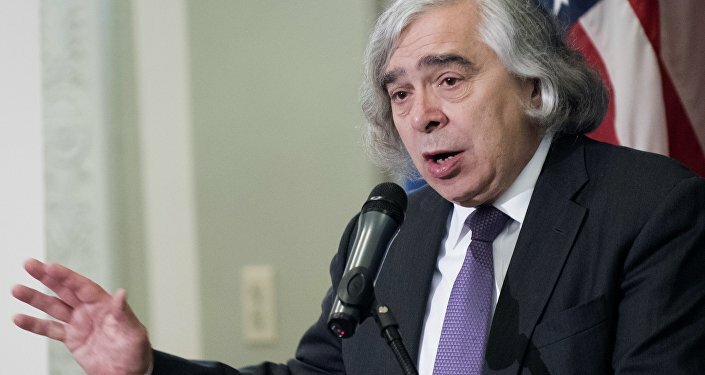 MOSCOW (Sputnik) – The cost reduction of renewable energy is absolutely crucial for the success of growing climate ambitions, US Energy Secretary Ernest Moniz asserted Tuesday at the COP21 Sustainable Innovation Forum. "This [green energy cost reduction] is the paradigm that we have to sustain… It will be a very critical foundation for the climate increasing ambition that we need to see year by year and decade by decade," Moniz said at the Paris climate conference's biggest side event. Building on the Climate Action program and the UN Environment Program (UNEP), the forum is focused primarily on business involved with the emerging green economy. There have been cost reductions of wind power, solar power, batteries and LEDs within the time elapsed between COP15 Copenhagen conference in 2009 and the ongoing Paris conference, the energy secretary said. The last six years have seen significant reduction in the cost of renewable energy, Moniz stressed. "Innovation and Cost reduction I think will be the key driver," he concluded. Solar energy development has led to record levels of output, with 39GW generated from photo-voltaic cells in 2013, according to the UNEP, with global clean energy investment rising by 17 percent in 2014, reaching $270 billion. However, an extra $100 billion worth of investments is required annually to meet sustainability goal, according to UN Secretary-General Ban Ki-Moon.